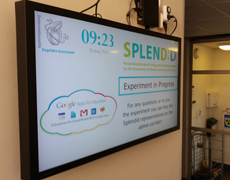 The 8th of June marked the end of the final SPLENDID school experiment, where students from Internationella Engelska Gymnasiet Södermalm (IEGS) had the opportunity to use the entire integrated SPLENDID system. The experiment was divided into two distinct phases, following the envisioned use of the SPLENDID system in prevention of obesity and eating disorders. The first phase was the Behavioral Assessment Stage (BAS), where the aim was for the students to use the system as much as possible for 14 days, while only getting feedback on how often they used it. Data collected during this period was used to create a baseline for each student from which the goals in the feedback phase could be derived. The second phase was the Feedback phase, where the aim was for the student to follow goals set up from the BAS phase. Students received feedback on how they ate and moved and how far their current behavior was from the set up goals. If the individual goal for example was to eat 320 g per meal and the user ate 290 g, the system would encourage the user to eat more and inform the user that she had eaten 30 g less than the set goal. At the end of the Feedback phase data on how well students had been able to follow the set up goals, was collected.